STAMFORD, CT – HARMAN International Industries, Incorporated (NYSE:HAR), is expanding its award winning JBL portfolio with the new line-up of JBL® Synchros headphones. From in-ear to around-the-ear, the new JBL Synchros E-Series headphones combine JBL engineering with innovative features sure to complement every lifestyle and every way of listening. JBL Synchros E50BT around-ear headphones: With your first listen, you'll know why these innovative headphones walked away with a 2014 Red Dot Design Award. Bask in bold JBL sound: huge 50 mm drivers with JBL PureBass performance envelop your ears, delivering an expansive soundstage with the clarity and precision of a 10 Hz to 24 kHz frequency range. Bluetooth technology allows wireless connectivity with your smart devices. Integrated ShareMe™ technology lets you take your music social, streaming music wirelessly to another JBL ShareMe™ equipped headphone, while Bluetooth multipoint connectivity enables you to pair seamlessly to two other devices. A single control button provides a pure connection for clear hands-free calling. A built-in rechargeable Lithium-ion battery keeps the sound going with 18 hours of uninterrupted playtime. The ergonomic headband and 3-D hinges provide long lasting comfort without fatigue. Soft leatherette ear cups cradle your ears for all-day comfort while providing a heightened level of passive noise reduction. The JBL Synchros E50BT's sleek design and five unique color combinations make a visual statement that’s as striking as its sound. 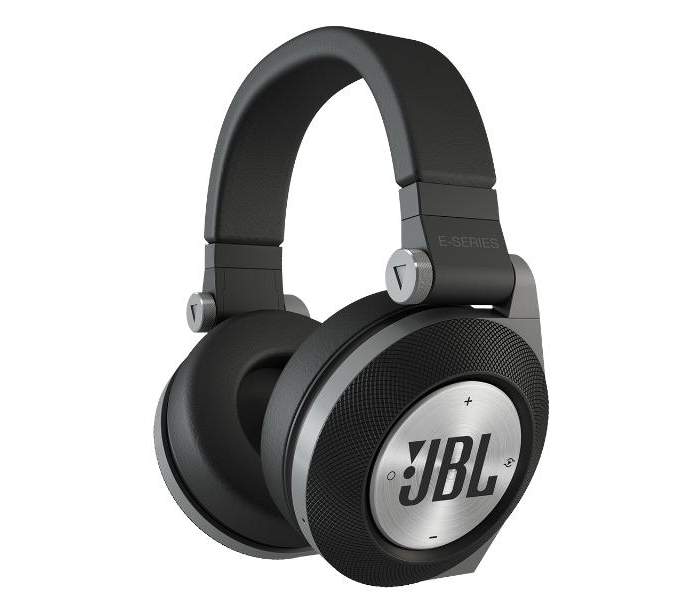 JBL Synchros E40BT on-ear headphones with Bluetooth: Take JBL’s signature sound with PureBass performance to the next level with the convenience of Bluetooth technology. Winner of a prestigious 2014 Red Dot Design Award, the JBL Synchros E40BT is not just the perfect complement to your smartphone or tablet. It’s also a social hub; a touch of the ear cup activates ShareMe™ functionality, streaming your content to another JBL ShareMe™ enabled headphone to turn your music into a concert for two. With premium 40 mm drivers, the sound is full spectrum with uninhibited clarity, uncompromising highs and expansive lows thanks to their wide 10 Hz to 24 kHz frequency response. The built-in, USB-rechargeable Lithium-ion battery provides best-in-class 16 hours of uninterrupted listening, with an included aux cable for passive listening. The JBL Synchros E40BT keeps you connected, not tied down. Seamlessly shift your connection between multiple devices with Bluetooth multipoint pairing, as well as transition from music listening to a phone call with the simple touch of a button. The ear cup-based microphone with echo-cancellation technology allows hands-free calling with clear voice transmission. Soft, leatherette ear cushions shut out noise from the outside world while they cradle your ears for all-day listening comfort and the ergonomically designed headband with 3D aluminum swivel hinges align the ear pads for perfect fit and ultimate wearability. JBL Synchros E30 on-ear headphones: You’re mobile, busy, connected; always somewhere between a call, a tweet or an email. The JBL Synchros E30’s are well suited to your busy lifestyle and help you make the most of your leisure time. Winner of a prestigious 2104 Red Dot Design Award, this next-generation on-ear headphone features JBL’s legendary sonic DNA, mobile-friendly controls and cutting-edge advanced styling. 30 mm drivers and JBL PureBass performance take your music to the next level, with broad frequency response and distortion-free bass you can feel. Slip on these head-hugging phones and relax into plush cushions that embrace your ears. Their distinctive 3-D swivel hinges with aluminum accents ensure freedom of movement, and a choice of five vibrant colors express your personality. The detachable, OS-agnostic cable with inline remote/microphone puts total control at your fingertips. JBL Synchros E10 in-ear headphones: Who says great things don’t come in small packages? Along with the convenience and portability of an in-ear headphone, you get full-spectrum sound, a comfortable secure fit, smartphone- and tablet-friendly features, and JBL Signature Sound with PureBass performance delivered directly to your ears by the 8 mm drivers. The E10 lightweight advanced design is not just style, unique angled ear-tubes and optimal fit reduces ambient noise to let you hear things they way they were intended to be heard. The one-button inline remote/microphone takes care of telephone calls, and the included handy carrying case takes good care of everything else. For additional information on the JBL Synchros E10 (MSRP $39.95), E30 (MSRP $79.95), E40BT (MSRP $99.95) and E50BT (MSRP $149.95) headphones, or to purchase, visit www.JBL.com.